Mexico was the first stop on our tour of Epcot's World Showcase. 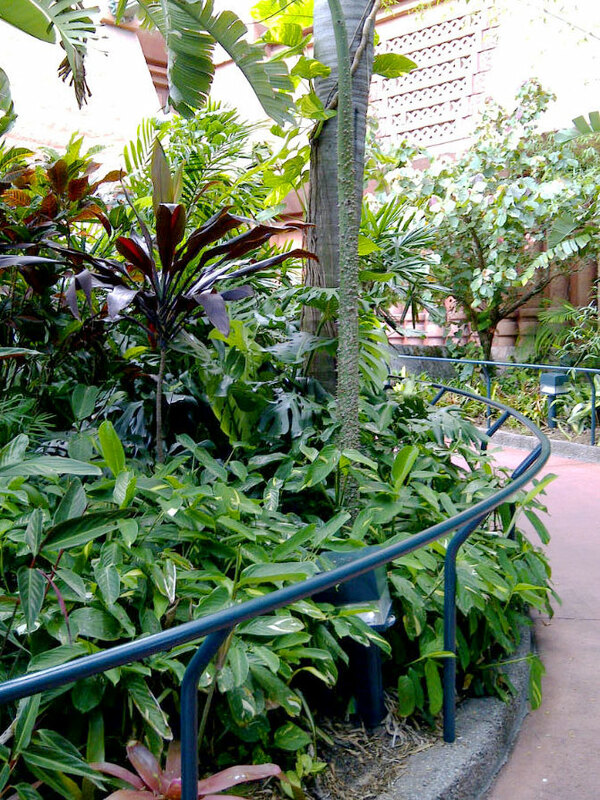 While the attractions lay inside a replica of a Mayan temple, Mr. and Mrs. Rainforest Gardener were more interested in the tropical gardens outdoors. My wife had a nice nap on the Three Caballeros ride and was disappointed to see it end, if only because it meant that she had to wake up. 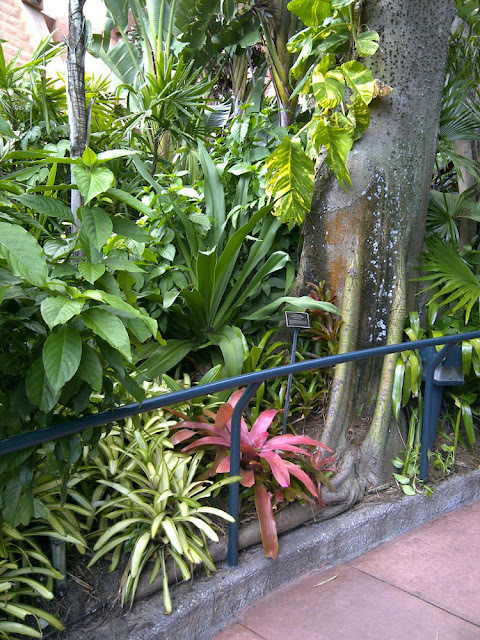 The gardens outdoors were wonderful for their lush display of tropical plants, but the lack of authenticity left me feeling like a nitpicking critic. 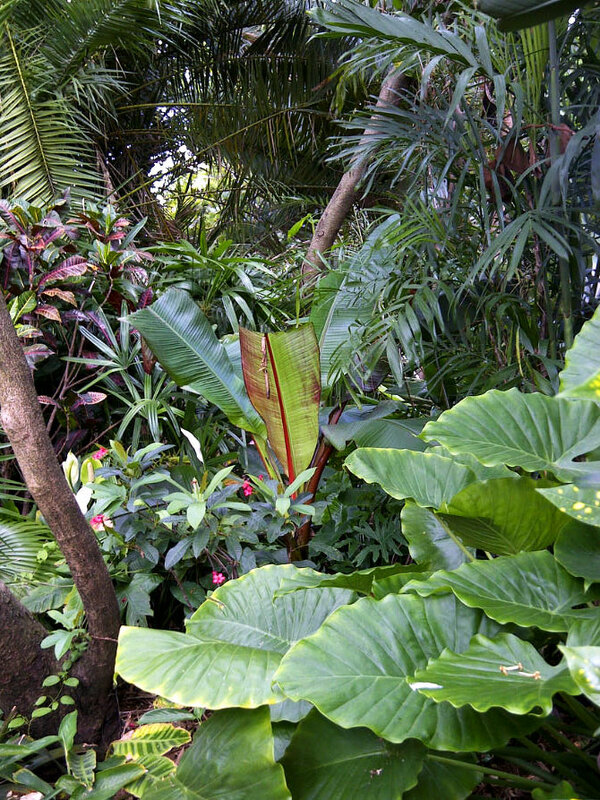 The Alocasias, date palms, and Abyssinian bananas make for an excellent tropical scene. But not a Mexican one. 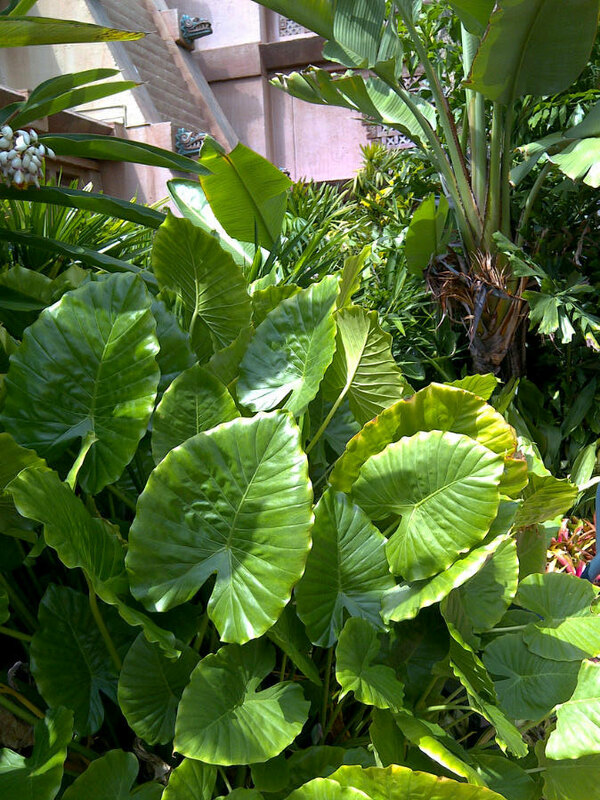 Ti plant, silk floss tree, Maranta. All not native to Mexico, but pretty nonetheless. No complaints here. 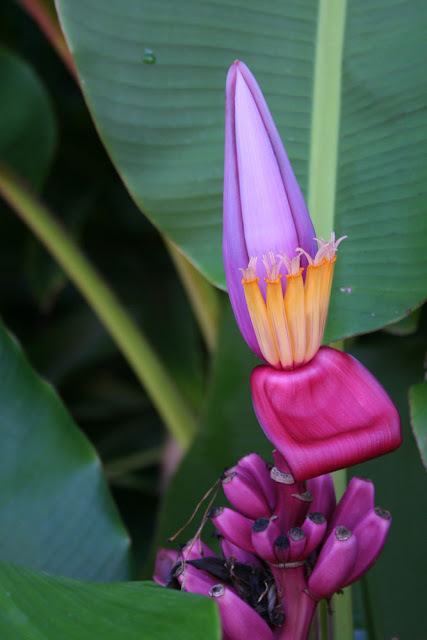 Look at the gorgeous pink velvet banana! 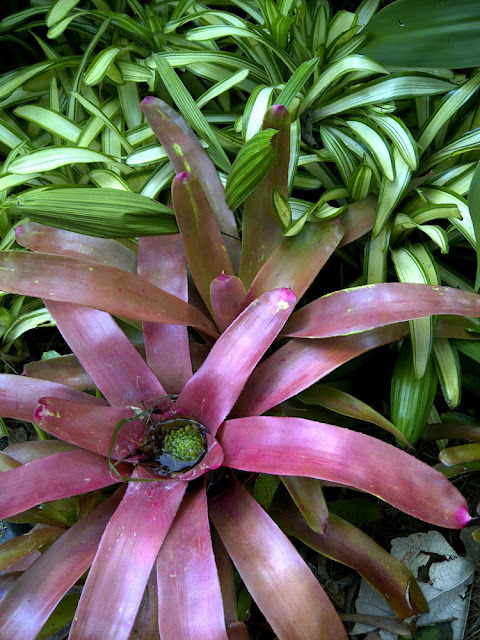 Bromeliads are Latin American! More bromeliads, please! Hey, a Neoregelia! That's the ticket! After all, a Mexican garden should have Mexican plants, right? Mind you, I am not complaining about the overall effect of the garden. I wish that MY garden could look so amazing someday! 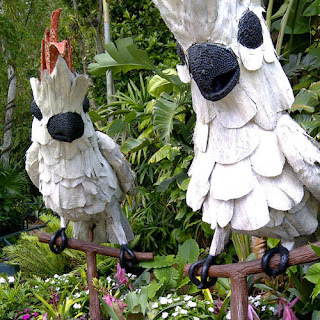 All I'm saying is that if they're going for authenticity, they should transplant some of those Southeast Asian Alocasias and South African Bird of Paradise plants and replace them with some Mexican Xanthosomas and Heliconias instead of whatever plant looks tropical. Come on! I love Strelitzia nicolai and Alocasia "California" too, but you use these all over the place, Disney! What a cool idea... 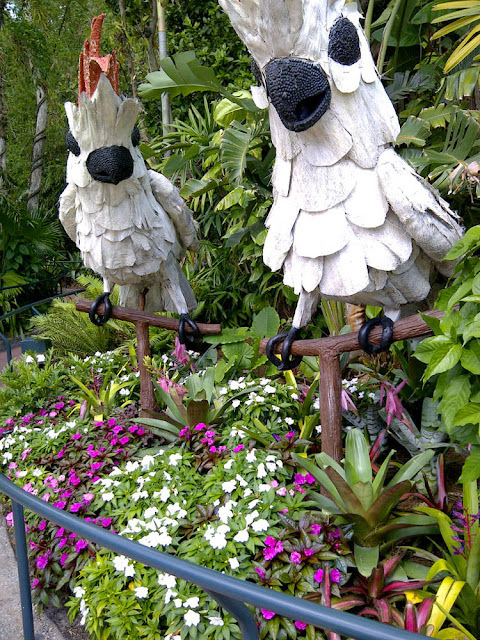 It would have been cooler if the birds were native to Mexico though. Okay, that's all the ranting for today. I'm not criticizing home gardeners, I'm just saying that I expected more from Disney. If you're looking for a list of houseplants or tropical plants from Mexico for your own theme garden, Mr. Subjunctive has provided us with a nifty little list. These are just commonly grown houseplants, but there are plenty more to choose from to create an authentic look. I'm sure that you guys can think of other Mexican natives too, so why not list off a few of your own in the comments! Wouldn't it be cool to make your own Mexican theme garden using predominantly Mexican plants? I only have a short comment. The birds are sort of creepy. Caesalpinia mexicana! A beautiful yellow-flowered tree that is freeze and drought tolerant, and blooms nearly every month of the year!